An ancient Chinese saying states that “A Good beginning is half the success”. 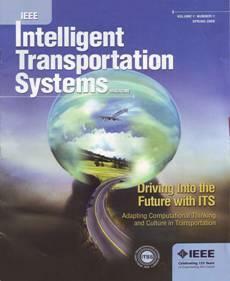 For the IEEE Intelligent Transportation Systems Magazine, I must acknowledge its long and bumpy beginning. However, the fact that we get our inaugural issue published is more than half the success. I remember the initial idea of creating an ITS magazine was proposed and discussed in one of our Executive Committee (ExCom) or Administrative Committee (AdCom) meetings in 2003 when our society is still an IEEE Council, but it was not taken seriously due to the budget constraint. 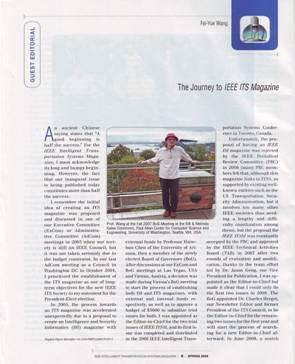 In our last AdCom meeting as a Council in Washington DC in October 2004, I made the establishment of an ITS magazine as one of long-term objectives for the new IEEE ITS Society in my statement for the President-Elect election. In 2005, the process towards an ITS magazine was accelerated unexpectedly due to a proposal to create an Intelligence and Security Informatics (ISI) magazine with external funds by Professor Hsinchun Chen of the University of Arizona, then a member of the newly elected Board of Governors (BoG). After discussions at our ExCom and BoG meetings at Las Vegas, USA and Vienna, Austria, a decision was made at Vienna’s BoG meeting to start the process of establishing both ISI and ITS magazines, with external and internal funds respectively, and approve a budget of $5000 to subsidize trial issues for both. 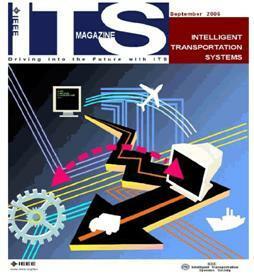 I was appointed as the Editor-in-Chief for the two trial issues of IEEE ITSM, and its first issue was completed and distributed in the 2006 IEEE Intelligent Transportation Systems Conference in Toronto, Canada. Unfortunately, the proposal of having an IEEE ISI magazine was rejected by the IEEE Periodical Review Committee (PRC) in 2006 (many PRC members felt that, although this magazine links to ITSS, as supported by existing well-known entities such as the US Transportation Security Administration, but it involves too many other IEEE societies and needs a lengthy and difficulty coordination among them), but the proposal for IEEE ITSM was eventually accepted by the PRC and approved by the IEEE Technical Activities Board (TAB) in 2007 after two rounds of evaluation and modification, thanks to the team effort led by Dr. Jason Geng, our Vice President for Publication. I was appointed as the Editor-in-Chief but made it clear that I could only do the first two issues in 2008. The BoG appointed Dr. Charles Herget, our Newsletter Editor and former President of the Council, to be the Editor-in-Chief for the remaining two issues for the first year and will start the process of searching for a new Editor-in-Chief afterward. In June 2008, a search committee was formed at our BoG meeting in Eindhoven, Netherland, and selected Professor Christoph Stiller as the Editor-in-Chief of the IEEE ITSM starting from 2009. As you all have known, the first four issues did not materialized in 2008, as originally scheduled. 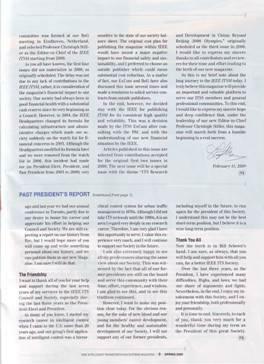 The delay was not duo to the lack of contributions to the IEEE ITSM, but mainly the consideration of magazine’s financial impact to our society. Our society had always been in good financial health with a substantial cash reserve since its very beginning as a Council. However, in 2004, the IEEE Headquarter changed its formula for infrastructure and administrative charges which made our society suddenly on the watch list for financial concerns in 2005. Although the Headquarter modified its formula later and we were removed from the watch list in 2006, this incident had made me (as President-Elect, President, and Past President from 2005 to 2008) very sensitive to the balance sheet of our society. The original cost plan for publishing the magazine within IEEE has a major negative impact to our financial safety and sustainability, and I have preferred to choose some outside publisher that could lead to substantial reduction in cost. As a matter of facts, our BoG has also discussed this issue several times and made a resolution to solicit publishing contracts from other publishers. In the end, we stay with the IEEE for publishing ITSM in favor of its high quality and reliability. This was a decision made by the ITSS ExCom after consulting with the PRC and receiving the understanding from the Headquarter regarding our potential new financial situation. Articles published in this issue are selected from contributions accepted for the first two issues in 2008. The next issue will be a special issue with the theme of “ITS Research and Development in China: Beyond Beijing 2008 Olympics”, originally scheduled for the third issue in 2008. I would like to express my sincerely thanks to all contributors and reviewers for their time and effort that lead to the birth of our new magazine. So this is my brief note for a long journey to the IEEE ITSM. I truly believe this magazine will provide an important and valuable platform to serve our ITSS members and general professional communities. To this end, I would like to express my sincere hope and deep confidence that, under the leadership of our Editor-in-Chief Professor Chistoph Stiller, our IEEE ITSM will march from a hard start to a real success.